It started innocently enough on Wednesday, when UFC posted a tweet with a sound bite from Daniel Cormier asking whether a victory at UFC 226 will earn him status as the greatest mixed martial arts fighter of all-time. Cormier, the UFC's light heavyweight champion, will attempt to become just the fifth UFC fighter to win titles in multiple weight classes and the second to do so simultaneously when he challenges heavyweight king Stipe Miocic on July 7 in Las Vegas. "I'm fighting these dudes at 39 years old and still getting my hand raised," Cormier said in the video, which was pulled from April's news conference announcing the fight. "So, yes, put me in the conversation." Can't get enough UFC? Subscribe to my podcast In This Corner with Brian Campbell where we break down everything you need to know in the Octagon. The comments from Cormier (20-1, 1 NC) drew the immediate ire of former 205-pound champion Jon Jones, who has been stripped of UFC titles a record three times due to disciplinary and performance-enhancing drug issues. Jones also owns a pair of victories over Cormier throughout their tumultuous rivalry, although their rematch last July was ruled a no contest when Jones tested positive for steroids. "If he's in the conversation," Jones wrote, "does that make me the m----f------ man?" While Cormier maintained radio silence on social media, he was asked for his response Thursday during an interview with CBS Sports. "None. [Jones] doesn't have a platform and I refuse to give him a platform," Cormier said. "He's a nobody. He has been suspended again. He's mired in controversy for drug abuse. Your issues are tied to steroids, performance enhancers. You don't get a platform when you're like that. It's like me glorifying Lance Armstrong." The 30-year-old Jones, who many considered to be the sport's greatest fighter in history before his reputation became stained, is currently awaiting a USADA hearing that has very much put his fighting future in question. Jones could receive a suspension as high as two or even four years as a second offender considering he also tested positive ahead of his UFC 200 bout against Cormier in 2016 that was canceled just days before the event. Jones, who served a one-year suspension that expired before he knocked out Cormier in their UFC 214 rematch, has maintained his innocence at each transgression and his team has stated publicly it believes Jones has a strong enough case to avoid a lengthy absence from the Octagon. During their first meeting in January 2015, Jones became the first man to take Cormier down and claimed a unanimous decision (although it was later revealed Jones tested positive for cocaine one month before). The fight took place before UFC entered a drug-testing partnership with USADA and asked whether the result of that fight should also be considered tainted due to Jones' history of PED use, Cormier provided an honest take. 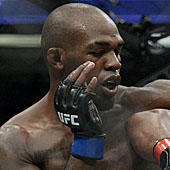 "[Jones] won the fight but, hey, since USADA has gotten involved with the UFC, he only fought one time," Cormier said. "He has had four fights scheduled. So he fought Ovince [Saint Preux in May 2016] and he fought me but that second one was a no contest. The Ovince fight was the only time he fought and there was no controversy surrounding it. So I'm pretty sure there was some dirty stuff going on [in our first fight]. That's why the test results were all jacked up in December." Cormier admits he has finally "let go of that baggage" in regards to worrying how the Jones chapter of his career will affect his overall legacy, or whether a victory over Miocic might repair any luster that was lost from losing to Jones. It remains hard to imagine their names not linked for eternity, however, considering how heated the rivalry has been, including an infamous news conference brawl in 2014. "This whole Jon Jones thing has been marred in controversy and never on my behalf," Cormier said. "So I can't let that dictate how I approach my career in any way, shape or form. I didn't do those bad things. I didn't do steroids. I didn't get taken out of a fight for steroid abuse once and test positive for steroids a second time. I didn't get, before the first fight, having rinky-dinky tests to start. There are so many reasons why I shouldn't be tied to him anymore and I've gotten back to the point now where it doesn't affect me." Jones, whom UFC president Dana White continues to link publicly with WWE universal champion Brock Lesnar in hopes of stirring up interest for a superfight once both finish out USADA suspensions, followed his critique of Cormier with one more tweet expressing his excitement to get back into the cage.